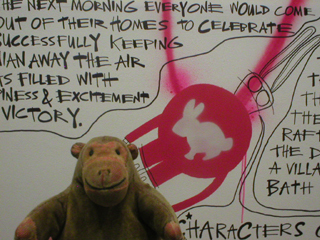 Mr Monkey found out that the Chinese Arts Centre was celebrating the Chinese New Year, and that 2011 was going to be the Year of the Rabbit. When he was in Manchester Mr Monkey dropped into the Centre to see what was going on. He found that there was everything you could want to make plasticene rabbits, or to draw rabbits, or to make a cardboard rabbit mask. 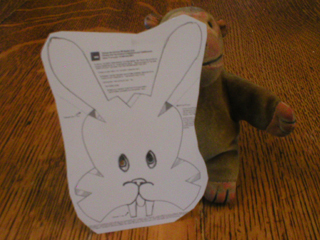 Mr Monkey collected one of the blank rabbit masks, but it turned out that it was intended for a full-size human, not a pocket-size monkey. 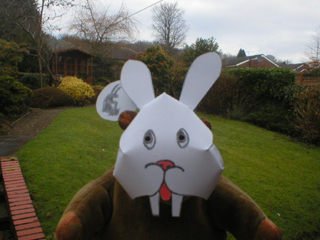 When he got home, Mr Monkey was delighted to find that he could download a pdf of the rabbit mask design. He cunningly made Mr Rik print it out at a reduced size. 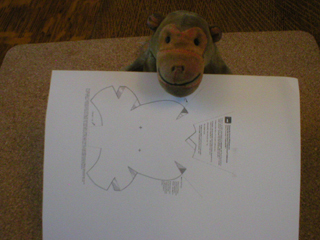 Mr Rik insisted that he'd printed it the right size for a young monkey, but Mr Monkey wasn't totally convinced. 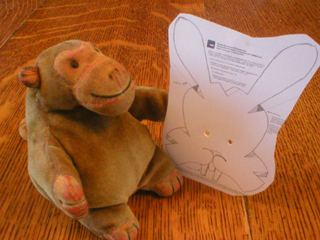 Mr Monkey told Mr Rik exactly where to draw the rabbit's teeth, mouth, nose, eyes and ears, and where to punch holes for Mr Monkey to see through. Then he looked at the mask and decided that it didn't want a lot of decoration. 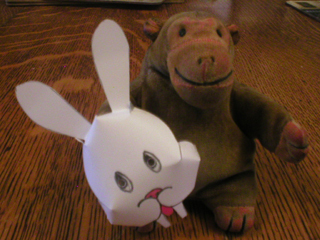 When Mr Rik had coloured in the nose and tongue of the rabbit, and had carefully cut away all the bits of cardboard that didn't look like a rabbit, Mr Monkey noticed that the mask was a bit smaller than it had been before. He began to think that Mr Rik might have been right about the size of the mask. Mr Monkey knew that there is a Chinese rabbit in the moon, using a pestle and mortar to grind herbs for a potion of immortality, and decided his rabbit would be looking up at the moon to see the moon rabbit. 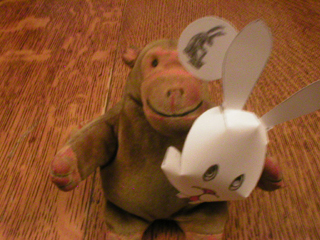 Mr Monkey watched from a safe distance while Mr Rik applied glue to bits of the mask and bent other bits so that the glue held them in place, and generally turned the sheet of card into a three dimensional rabbit face. Mr Monkey agreed, finally, that Mr Rik had got the size right, give or take a little. 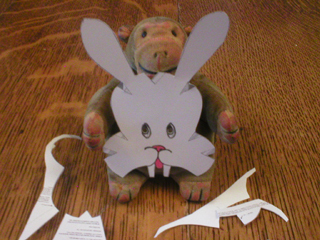 Mr Monkey cut out a circle of card to represent the moon and drew a rabbit working a pestle and mortar to one side. 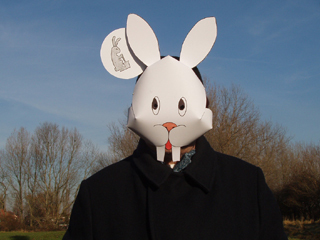 Then Mr Rik fixed it to one of the rabbit mask's ears. Mr Monkey's rabbit mask was complete! Mr Rik liked the mask that Mr Monkey had designed so much that he made a human-sized copy with one of the card blanks he'd collected from the Chinese Arts Centre. Then they went out into the nearest field and impersonated Chinese rabbits looking up at the rabbit in the moon.